Thanks for the post, and yippee for the good news. Yes! I hope that I can make an NYC trip work to see it. Alison, thanks for putting this up here for Kate, Shado, and me! I suppose HOH and NLC will be along eventually, too. Seriously, it’s good to see they’ve got nearly the whole off-Bway cast back. Obviously Sydney Lucas is great, but I wonder how long she can stay in the role. She’s supposed to be playing age 5, right? I’m (pleasantly) surprised they were able to bring her back at all. I hope the fitness book is progressing well. Does shoveling snow count as a fitness craze? That’s been my near-exclusive form of exercise this winter. Something to do in New York! This is so cool! It’s really happening! Can I tell you how cool it was to walk into the University of Michigan undergrad library last week and see familiar AB comics on the video displays, including the DTWOF Bechdel Test strip and p. 118 of Fun Home?! Then I swear, I walked to the second floor and there WAS p. 118, fixing the water fountain that’s been dead since before Thanksgiving. She had long hair, and I didn’t check her footwear or her pants…but she had one massive ring o’ keys. Alison, this is WONDERFUL NEWS, JUST WONDERFUL!!! Really happy for you and all of us for whom the book has meant so much. I didn’t know it the play was a finalist for the Pulitzer Prize- am going to root for that too! That little video is quite moving. Thanks for posting. 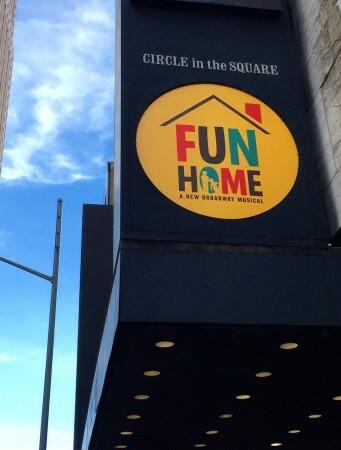 Looking forward to eventual Los Angeles production of “Fun Home”. Andrew — I had the impression that young Alison (Sydney Lucas’ character) was more like 8 or 9. My niece played the little girl in Ragtime in Chicago when she was 14, so playing under age is pretty common. I’m guessing Sydney will be fine for a couple more years. I was so blown away by the off-Broadway version that I want to enshrine the experience, making me reluctant to see it twice. Yet, part of me wants to see it again because with such a rich mixture of language, song, and staging I know I missed things the first time around. The news about the play and the video are so great. So great! This post about thaumatropes made me think of you and your .gifs. One of the ways That the 19th C played with animation. I retweeted at you on twitter, than realized that you’re rarely there these days. I just heard that Sirius XM radio will be broadcasting the complete cast recording of Fun Home tonight! At 11pm Eastern time on their Broadway Channel. A-MAZE-ING! So incredibly proud and thrilled for you Alison. Mmmm, not sure why I came up as The Anony Mouse. That was my little PSA about the show! Great News! I hope I can get up there! I bought a copy of Essential DTWOF for my girlfriend’s Christmas present, but the relationship didn’t last long enough for me to give it to her. I read it last weekend and snorted martini when I got to the Hairball of Hope line. Ellen O, in the book Alison says that she was four or five when the Ring of Keys episode happened (page 117). I didn’t consciously remember that — it’s taken me this long to get around to looking it up — but that’s probably why I assumed Little Alison was also supposed to be that age. There’s no reason why the actual time of that incident has to determine the age of the character in the play, though. Everybody agrees that Lucas is excellent, so I hope she’ll be able to remain in the role as you suggest. I’m pleased to see how wrong I was about how many of the old crowd are still checking in here. Dr. Empirical, your ex sounds like a big dummy head. We should go to New York, together, to see this fabulous show. All the supposedly intelligent people I follow on Twitter have just discovered that moving a couple of sliders in Photoshop will change the white balance in a photo of a dress, and they can’t stop talking about it. As they say, I cannot even. The rational thing to do would be to slit my throat, but being a creature of emotion, I decided to come over here and make a totally off topic comment instead. Now back to your regularly scheduled dykes to watch out for. Full disclosure: this comment may have been influenced by Madame Smirnoff. Also, this seems like an appropriate occasion to thank Alison for tolerating my neuroses in the comments section all these years. PS. Am I the only person who is getting served Fun Home advertisements all the time? Youtube, the New York Times… It makes me feel so beloved to know that all these soulless money sucking capitalists know exactly what I’m interested in. Following up on Andrew’s post I’ll just mention that coincidentally, xkcd has a strip on the “the dress illusion” today: HERE. Likewise, here is very cool video demonstrating the underlying illusion: HERE. I apologize for presuming that everyone would agree with me about what’s interesting. It was foolish of me not to realize that the intelligent people over here would be interested in the same things as the intelligent people I follow on Twitter. I will try to avoid such foolishness in the future. Me too! I get Fun Home ads everywhere! I thought it was because of those dreamy moments I spent on the ticket site, pretending there was a way to get from Oregon to New York, and a place to stay in New York, and a date (my sister on Long Island? my sister in Plattsburgh?) and a way to get home. Andrew B (various #)… I didn’t try to play around with the color balance in The Dress (I personally think that it’s blue and gold), but I kind of thought that might be the cause of most of the perceived color differences in our Internet Machine age. Oh, btw, Kansas prosecutors may now have the power to imprison teachers for selecting “harmful” text books. I wonder if that includes textbooks with references to evolution and global warning??? Congratulations on the move to Broadway! Wow! Fun Home was a Pulitzer finalist? How did I miss that? So glad to see that AB is making her way to the Great White Way. I will be there. As for my nom de plume, now more than ever I feel like upchucking a hairball of something. Perhaps a hairball of despair, I’m trying to remember how hopeful I felt in 2008. I recall the morning of Election Day in November 2008. The lines were immense. I voted around 6:30 AM, and I was floored. Later that morning, I logged into this blog and decided to end my decade-or-so self-imposed web silence, and picked that improbable username as if impelled by an invisible force. The name fits me well, I really am a hairball, an outside glob of something on the carpet not quite what you expected to be stepping into, but here it is/here I am. I’ve had a bunch of health and employment adventures in the intervening years, and I’m on the cusp of a few more. Nonetheless, as I’ve contemplated the significance of my nom de plume/nom de guerre, and wondered if I should change it, the universe has told me that “hairball” in some form or fashion is in my DNA, so long after Hopey-Changey Obama is put out to pasture, I will be still be Hairball. hairball (#23): My favorite quotation from Leonard Nimoy as Mr. Spock: “In the battle between good and evil, I have noticed that good only wins if good is very, very careful.” I also remember 2008. Now the trumpets summon us again (which 60’s notable does that line come from?). At a moment when Hillary and e-mail gate somehow is more significant than the Bush administration starting the longest war in U.S. history on false premises, we nevertheless are required to make new efforts of our own (those last 11 words are from a different speech of the same 60’s political notable). Knocking the conservatives for six in the 2016 elections (as we might say on the High Plains) is a good place to start! @h_o_h: I haven’t been disappointed in Mr O. In 2008, I looked at him and saw someone who was likely to be a terrible, terrible president. At the same time, I looked at John McCain and saw someone who would be a terrible, terrible president who would definitely empower homophobes and other baddies and might, just possibly, invade Russia. So I voted for Mr O with a clear conscience that year. @Kate L: I love Mr Spock, and I love Leonard Nimoy for a bunch of non-Spock things he did, as well. There was the “Full Body Project,” where he recreated famous photos, replacing the models with women who are less skinny or less young than are the models who posed for the originals. That was a simple and strikingly effective way of showing just how different the collection of women depicted in mass media is from the set of women who actually exist on earth. Of course, 99% of the public reaction to these photos was along the lines of “Sick! Leonard Nimoy likes to take pictures of naked fat chicks!,” which is depressing, but hardly a surprise given the way our culture polices anything that might create the impression that women don’t have to fit some prefabricated mold to be desirable. … more on Republican Governor Sam Brownback and the war on teachers in Kansas. Somewhat off topic, but how terrific is this? Megyn Kelley on Fox News claimed last night that Ferguson. Missouri, city government-style racist e-mails could be found in any big corporation. Well, I beg to differ.I worked as a petroleum geologist for Chevron in New Orleans back in the 1980’s, well before e-mail became common in industry, but I never encountered racist language in any company communication. I suspect anyone who would have used such language would have been fired as an embarrassment to the company and deservedly so. Of course, these days I hear people in oil companies use the f-word a lot (fraking).